Powerful is the single word that best describes the Testo 872. 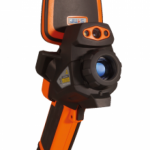 Testo has packed an overwhelming number of features into this compact thermal imager. 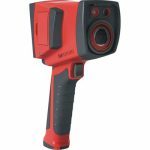 Built on the proven Testo 870 platform, the 872 sports the latest 320×240 detector with 640×480 super-resolution capabilities as standard. This is an incredible resolution for a sub $5k thermal imager and unprecedented at the time of this writing. A picture tells a thousand words and the thermograms below speak volumes. There is no substitute for sheer pixels when communicating to your end users with thermal imagery. 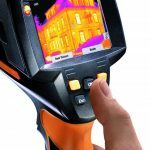 The thermal sensitivity is also a very respectable 0.06°C, making it more than capable of undertaking building envelope performance inspections with confidence, which is where this type of thermal imager excels. The 42° angle lens certainly favors building inspections or large target areas such as fixed plant or process equipment. It is less than ideal for electrical inspections, but the extra detector resolution certainly does make up for the short comings. Geometric resolution is still only 2.3 mrad, which is comparable to many cameras of lesser resolutions with narrower angle lenses. The user interface is arguably one of the best I have used in an entry-level camera. There are no ambiguous icons to decipher, as each menu item is clearly spelled out for the function it performs. 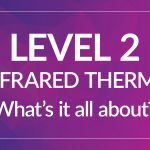 Functionality is laid out in a clear and intuitive order and follows the typical logic sequence a thermographer would perform in the field. For a novice or first-time user, it doesn’t get much easier than this. I avoid using the term simple because it’s not simplified or dumbed down. In fact, the user interface supports a host of comprehensive tools and functions that are more akin to a professional camera. Similar to all Testo models, the Testo 872 has a user programmable button which can be assigned to a regularly used function. This is something I always look for in an instrument as I can save time and frustration by instantly accessing something of importance. Unfortunately, not every function can be exclusively represented on a keypad, so this is a great workaround to customize a device for each operator. For this thermal imager, I typically assign the quick key to the scale function so I can manually manipulate the temperature scale (level and span) on the fly. The Testo 872 has integrated Wifi and Bluetooth which gives it some excellent communication abilities. The Testo 872 can wirelessly transfer data from a Testo 770-3 clamp meter and the Testo 605i humidity measuring device. This is certainly the way of the future but up until now all apps I’ve seen are little more than a token gesture of demonstrating wireless connectivity. In other words a “gimmick”. While the live streaming and remote control certainly works, in real terms its practical capability is limited by the Testo 872 not having a viable fixed mounting option (ie tripod mount). Typically professionals require remote control or viewing capabilities when facing environmental and physical challenges that require remote operation. Often this involves hazardous or inaccessible areas, whereby the camera is remotely mounted (usually on a tripod) and positioned to observe the system or object, while the operator can remote control and capture imagery at a safe distance. Another example might be monitoring a production line, system or process from a fixed location, where the operator requires a local or more convenient user interface. In all these instances, without a mounting point or ability to operate the camera hands free (ie something has to hold it), this wireless user interface has very little value, other than impressing your friends at a barbeque (which I just did). This level of connectivity makes much more sense in high end professional cameras that are capable of process measurement or continuous monitoring type tasks. That said, the smart phone app interface is excellent and one of the better pieces of APP programing I have seen. The real time streaming is surprisingly well synced, with very little lag, buffering or dropped frames. I was using the app on a Samsung 8, and it was very quick and responded well to the camera without any glitches. This is quite rare for an app of this type and I commend the manufacturer for making such stable and professional APP. I know that most will be interested in the APP for providing immediate on-site reports to their end users. If you are the kind of operator that is satisfied with the standard manufacturer templates to generate reports then you will no doubt be happy with the output from the app. It stays completely on brand and generates a report incredibly close to that of the Windows PC software. In fact it is hard to pick the difference. The app is of course much slower than a PC interface and takes some work to generate anything comprehensive. My own opinion is that this would only suit in-house personal wanting to share information easily and quickly with peers. If you are a third party contractor or service provider this level of reporting would be mostly insufficient to meet any industry standards and I would think twice (or seek advice) before determining this was acceptable for your end user. Convenient, yes. Standard compliant; no. This deserves a special mention because it is so rare that an entry level camera would have a temperature measurement range up to 650 deg C. This kind of measurement capability is usually reserved for much higher end models, so this would be seen by many as a huge bonus. 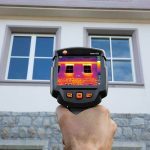 It is also intended for those with more than a basic knowledge of infrared as measuring at such high temperatures can be challenging and involves much larger potential errors. If you need this level of temperature measurement for process control purposes (ie where accuracy is required), make sure you have the requisite training or consult a professional first. The temperature range is split into 2 very usable ranges. The first is -30 to 100°C which maintains excellent sensitivity for low temperature applications, and then the higher range of 0 to 650°C. So is it a professional grade camera? You might wonder why I keep referring to this as an entry level camera when it clearly demonstrates some very high capabilities. Albeit value packed with an excellent array of functions there are still some key attributes that it is missing in my opinion to win the title of a true professional grade camera. A fixed focus system is a major limitation and also one of the reasons that makes this unit low(er) cost. The inability to focus reduces the cameras minimum focal length to 0.5 meters. To be honest, most of my images taken at around 0.5 meter were blurry. The camera is quite sensitive to the focal length at this distance and was very unforgiving. It was not until I downloaded the image to my PC that I realized portions of my image were badly out of focus and less than ideal for presentation purposes. In the field I am only going to estimate my distance, allow much more room for error, resulting in me standing further back than I would prefer. This is a real issue for anyone measuring smaller targets, or performing electrical inspections. Getting back to your office, only to learn that some images are unusable or the quality is compromised from blurring is simply unacceptable to a professional. Image below taken at approx. 30 – 40cm. The 42° angle lens is fixed and cannot be changed. That is optional lenses cannot be bolted on. As mentioned previously this lens angle is great for larger objects (and specifically building diagnostics), but not so great for smaller objects (ie electrical inspections). Imaging LV distribution boards at 0.5 meters with this angle is too far away in my opinion. The 9Hz refresh rate also squarely places this in the entry level bracket, with professional models having real time frame rates above 25 Hz. The battery system is another area that makes this more entry level than professional in design. While the battery is technically field replaceable, in my opinion, it is not designed for regular swap-out. The camera is delivered with a battery recharger intended for in-camera charging, with the external charger being an “option”. The battery cover is a part of the handle structure and held in place by plastic clips. Years of experience with this style of battery bay (and plastic clips) tells me this will not cope well with daily swap-out of the battery. Furthermore when removing the battery you are unsealed sections of internal electronics and exposing them to contamination and environmental ingress. I would not recommend this in dirty or industrial environments, where the risk of ingress is high. That said, the standard battery will give you 4 hours of operation which is more than sufficient for most predictive maintenance or building inspection requirements. In all, for the current asking price of the Testo 872 it is hard to find better value. It has excellent resolution and image quality never before seen at this price point. The camera stays true to brand with it outstanding German build quality and design. While I stop short of calling this a professional camera, it does not mean that in the right application you won’t be able to generate professional grade results, and indeed there will be many users who purchase this unit for professional service work.